Last time, we talked about Star Trek and Star Wars—but especially Star Trek—as expressing the ideal of a certain type of civilization. Now we can broaden the range of examples. Science fiction and fantasy make an excellent laboratory for thought-experiments here, as in so many things. 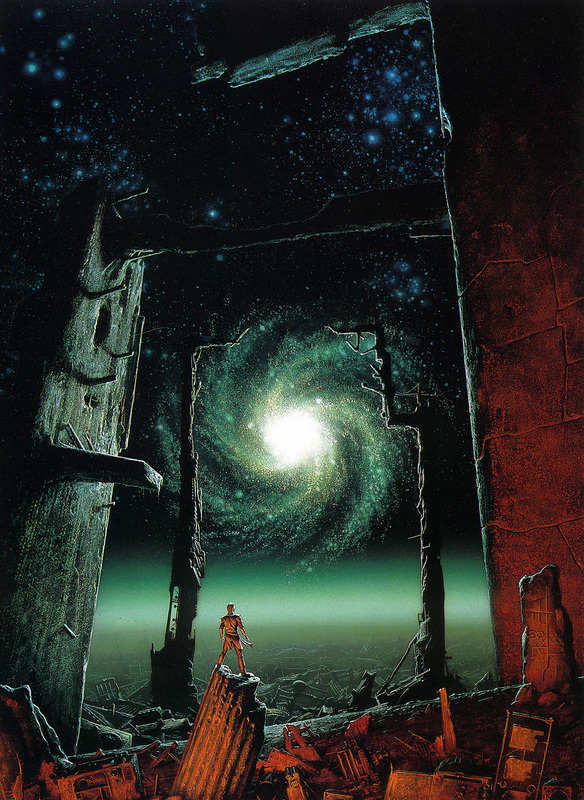 The threat that civilization will fail and collapse is a classic way to create a dramatic situation for a SF story. 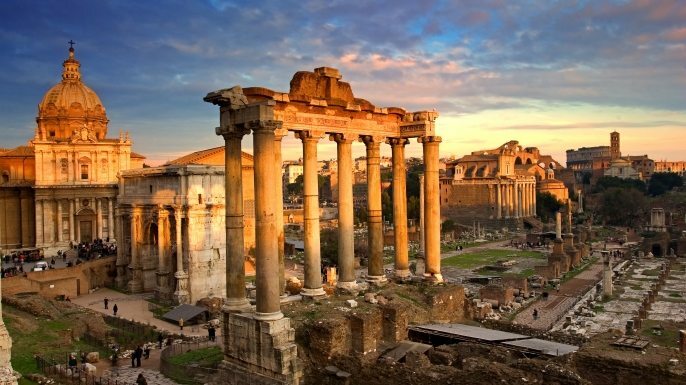 The most common historical analogue, of course, is the fall of the Roman Empire in the West. I’ve mentioned H. Beam Piper’s Terro-Human Future History, which includes at least one such decline-and-fall. The novel Space Viking (1963) gives us a whole culture of space-traveling barbarians, raiding the decadent worlds of the old Federation. The events of the story suggest the hope of a return to lawfulness in the formation of a “League of Civilized Worlds.” But given Piper’s cyclical theory of history, this initiative will yield no permanent resolution; the story has a happy ending, but the history does not. Poul Anderson wrote a series of stories about Sir Dominic Flandry, a dashing secret agent of the Terran Empire reminiscent of a far-future James Bond (though Flandry first appeared in 1951, Bond in 1953). When he can spare a moment from chasing women and loose living, Flandry devotes his efforts to shoring up the decaying Empire, though he realizes that in the end the “Long Night” is inevitable. There’s a certain kind of romance, a mood of grandeur and doom, about these falling empires. Naturally, they tend toward the somber and the tragic. A more upbeat tone characterizes stories in which the fight to preserve civilization has a chance of succeeding. 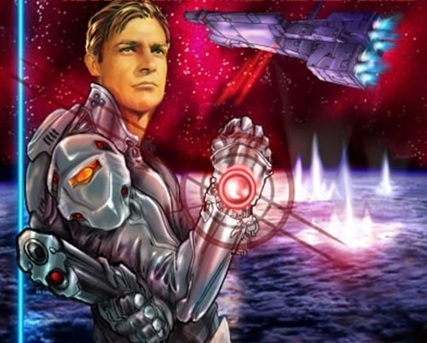 In the Lensman series, E.E. Smith actually refers to the heroes’ multispecies galactic community simply as “Civilization.” That polity reflects the cooperative, yet freedom-loving, nature of the beneficent Arisians, who have nurtured it in secret over millions of years. The Lensmen’s opponent is “Boskone,” which originally appears to be a mere conspiracy of space pirates or drug dealers. When Boskone eventually turns out to be a whole independent culture of its own, based in another galaxy, the conflict becomes one of diametrically opposed cultures, rather than simply of order vs. disorder. But the Boskonian culture is one of thoroughgoing tyranny, from top to bottom. At every level, those in power scheme against each other. Lacking any honor or ethical code, they engage in assassination and undermine each other’s plans. Those at the bottom are essentially slaves. The Civilization led by humans, on the contrary, respects human dignity and freedom—although the fact that these cultures have been essentially on a war footing throughout their entire history renders that freedom a little less far-ranging than we might imagine. The Lensman example reminds us that the defenders of civilization are not always fighting against barbarians. Autocracy and regimentation bring their own kind of chaos, as lawless warlords battle among themselves, not caring what common folk are trampled in the process. It’s a particular kind of civilization that’s worth preserving. To Valeria’s mother Virginia, “the last that stood against Chaos” is a phrase to conjure with. That’s true for me, too. If civilization represents a certain kind of order—that of the Lensmen, not Boskone—what kind are we talking about? It’s not always easy to explain. Chesterton’s random examples do cast some light on the question. A community that has bookcases has books—implying a continuity of knowledge and literature, as well as the leisure to read them. Coals to keep one warm in winter suggest both the satisfaction of basic human needs, and the whole machinery of society and technology that brings the fuel from the mine to the fireside. Pianos reflect art and a developed culture. And policemen indicate a society in which there is at least some attempt to defend the ordinary citizen against the depredations of the powerful and unscrupulous—the rule of law, of which more anon. In the particular culture to which I belong, when we hold up a certain sort of civilization as an ideal worth defending, what we have in mind is a good order in which spontaneity and creativity can flourish, and people can live their lives without constant fear or privation. There’s an order that protects the weak against the strong, but there is also enough looseness for individual variation, experiment, and adaptation. In the “alignment” terms we discussed last time, you might say the position I’m taking is neutral good, tending to lawful. There’s one particular aspect of this ideal, though, that science fiction is peculiarly suited to address. We’ll talk next time about civilization and science. Hatfields and McCoys, Marvel and DC, Star Trek and Star Wars. One never knows how seriously to take these deadly rivalries. Personally, I like both of the science-fiction series, so I see the Trek-Wars wars more as a difference in tastes. Sometimes you feel like a hamburger, sometimes a pizza. The particular difference I see in SW and ST has to do with their atmospheres or sensibilities. The Star Trek universe—I’m focusing especially on the original series (“TOS”) and movies here—is civilized. There are plenty of things that go wrong, and going where no one has gone before frequently brings us into situations of conflict. But the Federation itself is organized and mostly decent. There’s an actual chain of command. Authority figures are typically respected. That’s the first approximation. To be sure, Captain Kirk and his successors don’t mind defying Starfleet orders now and then. But when Our Heroes turn out to be right, they’re back on amicable terms with their superiors in short order. At the end of Star Trek IV: The Voyage Home, Admiral Kirk, after stealing and destroying the Enterprise (among other things), is demoted to Captain again as his “punishment.” But everyone understands this as simply restoring him to the role he prefers and serves so well. There’s enough divergence among Starfleet personnel to make the stories interesting, but actual villains in the corps are relatively rare. Starfleet and the Federation are the orderly defenders of liberty and individual (in our parochial world we say “human”) rights. That Gene Roddenberry optimism is embedded in the show’s DNA. In Star Wars, it’s the villainous Vader who wants to “bring order to the galaxy” (as he says around 1:38 in this clip), and it’s the motley, disorganized rebels who fight for freedom. Our Heroes are rebels who defy the authorities. Their chain of command is informal, and pretty much anyone, even the carefree Han Solo, can become a general. Though the swashbuckling, colorful Star Wars universe may seem lighthearted, it’s actually a rather distressing place. The nearest outpost of civilization to Luke’s uncle and aunt’s farm is Mos Eisley, a “wretched hive of scum and villainy.” Slavery has flourished on Tatooine from a generation ago (little Anakin) to Luke’s era (Jabba’s servitors)—and apparently neither the Empire nor the old Republic did anything to stop it. Intelligent droids are second-class citizens. In the latter days of the Republic, trade combines were permitted to conduct outright warfare against whole planets (Phantom Menace), with no more than tardy, ineffective intervention by the Jedi Knights. It seems a much less comfortable universe to live in than Star Trek’s Federation. Both have their flaws, but the Star Wars ’verse seems much more unstable—if colorfully so. There’s nothing wrong with this as a story setting. A varied world full of dangers makes for more exciting stories than a placid utopia. But the Star Wars setting calls out to a different kind of fan than that of the Trekkies. Vader’s desire for order actually has good character-based reasons—one of the things the prequel trilogy got right. In a world where you’ve been held as a slave, your mother has been tortured to death by barbarians, and your beloved is menaced by assassins at every turn, a desire for law and order is extremely understandable. But it’s the lively Rebels with whom the viewer’s sympathies lie. In this democratic milieu, quirky individuals and inspired improvisation flourish. Both the SW and ST approaches represent ’60s sensibilities, but one is slightly later than the other. Roddenberry’s Star Trek expresses the firm American optimism of the Kennedy era (1960-1963); it isn’t accidental that in the follow-up movies, Roddenberry kept wanting to tell a story about time-traveling to meet JFK. Star Wars, on the other hand, evokes the counterculture of the late ’60s, which distrusted authority and prized rebellion—not to mention colorful chaos. It’s instructive to see how J.J. Abrams handled the two, since he has had the opportunity to reboot both Star Trek and Star Wars franchises. My sense is that he’s handled SW much better than ST. Abrams’ Star Trek movies show us a distinctly grittier, more chaotic world than Roddenberry’s. It is, in fact, more like the Star Wars universe. And I don’t think I’m alone in feeling that, entertaining as Abrams’ ST movies may be, he doesn’t quite “get” what Star Trek is about. His Star Wars continuation, The Force Awakens, however, is to my mind an excellent (if not flawless) extension of the SW universe. In other words, making Star Wars more like Star Wars is a good thing, right up to the point where it begins to get slightly repetitious. Making Star Trek more like Star Wars runs the risk of losing the very things that makes Roddenberry’s creation distinctive. Both are good things; but they’re not good in quite the same way. One of the interesting things about the Dungeons & Dragons (D&D) game system is the notion of alignment. D&D is built on ideas from a whole range of fantasy stories. Many of those stories involve a conflict between good and evil. Some, however, make the central conflict one of law vs. chaos. D&D’s creators took the surprising step of adopting both oppositions, but keeping them distinct. The result is a three-by-three, nine-cell matrix. 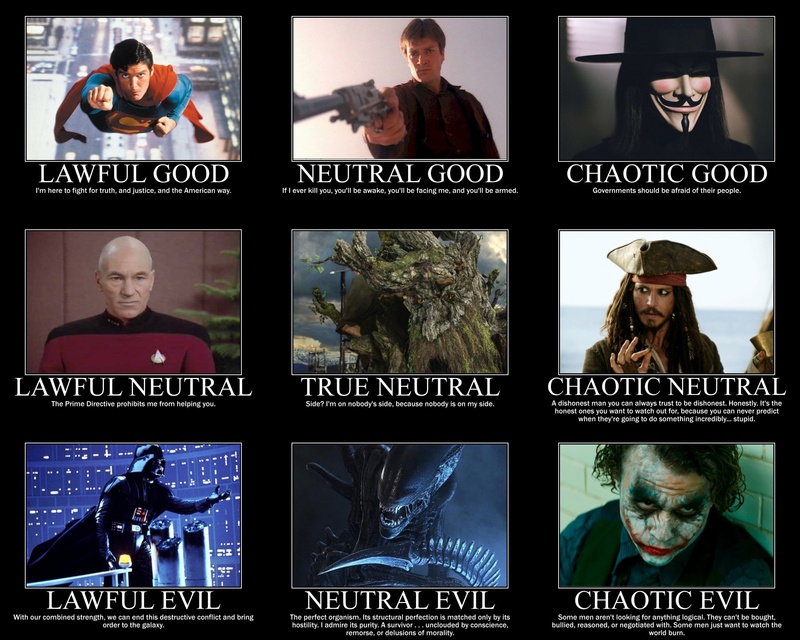 A character’s personality and ethical stance can be lawful good or chaotic good, or straddle the two as neutral good. The being can also be lawful or chaotic evil—the evil of 1984 or of Beowulf, let’s say—or an intermediate neutral evil. Finally, someone can be lawful neutral (think an OCD personality), chaotic neutral (low impulse control), or “true neutral” double-neutral (an unprincipled pragmatist, perhaps). The range of combinations allows for shorthand expression of quite an array of character types. I wouldn’t necessarily buy into this particular classification of famous fictional characters . . . but it gives us an idea how the alignment scheme works in practice. The alignment chart also yields a neat way to encapsulate the ST/SW difference we’re examining. 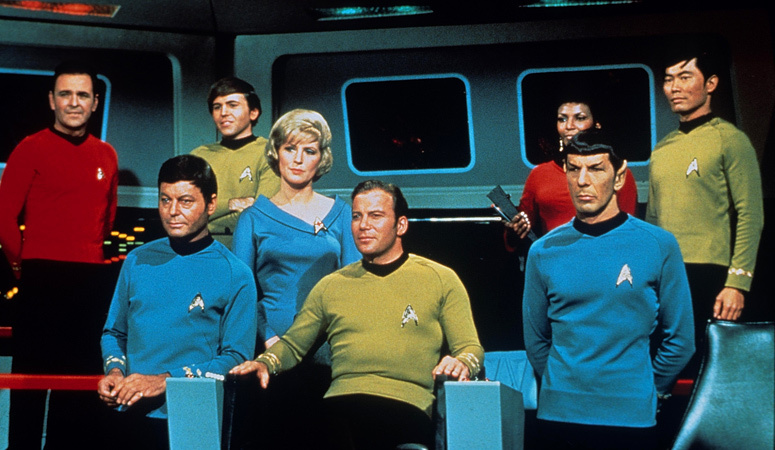 Star Trek honors the lawful good: the interstellar police force, the scientific explorer, the careful defender. 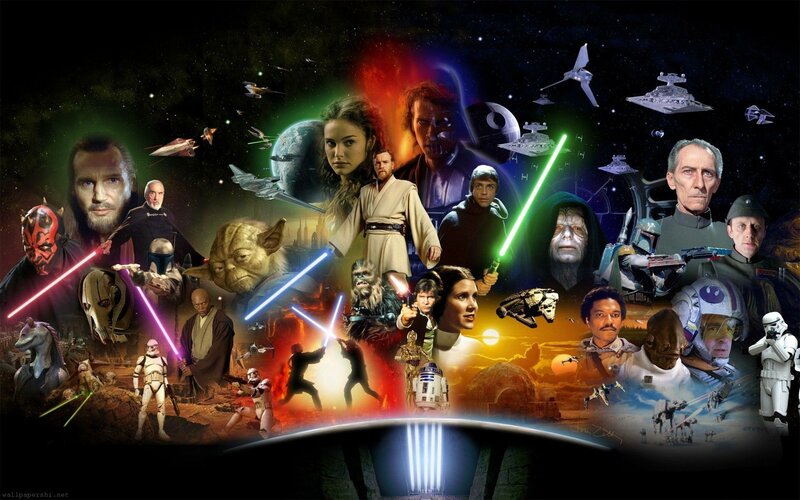 Star Wars admires the chaotic good: the lovable rogue, the solitary guru, the loosely organized band of allies. Here’s yet another way to put it. Science fiction writer Jerry Pournelle, whose doctorate is in political science, laid out in 1963 a map of political “alignments” with two axes, producing a far more useful classification of positions than the usual left-right continuum. (Pournelle’s 1986 essay provides a detailed explanation.) The two dimensions in Pournelle’s scheme are “attitude toward the state” (from state as evil to state worship), and “attitude toward planned social progress” (from rationalism to irrationalism). If we think of these axes as applying to the character of a culture, not necessarily to politics per se, we can express the ST/SW divide in Pournellean terms. I’d put TOS-era Star Trek somewhere around 3/4’ or 3.5/4’ on the chart, believing pretty strongly in reason and ambivalent about state power. Star Wars, by contrast, seems to live in the 2/2’ region, not far from the “American ‘Counter Culture’” to which I compared its ambiance above. Each milieu will tend to attract viewers who are sympathetic to the points of view expressed in its neighborhood on the grid. What it comes down to, I think, is whether we see the best conditions for free and fruitful lives primarily in order or in disorder. Both are arguably necessary. But is what’s best for people a basically orderly society with a healthy modicum of chaos; or a wild-and-crazy culture with just enough organization to hang together? The Star Trek/Star Wars contrast thus leads us up to the question of what makes for a good society, a true civilization. There’s a good deal more to be said about this, and I’ll take another crack at it next time. 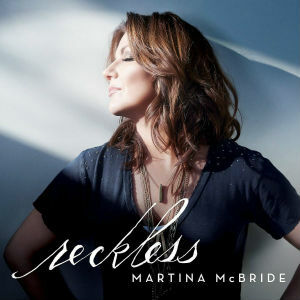 The name of the title song from Martina McBride’s album “Reckless” (released April 29, 2016) matches that of another favorite of mine, Alabama’s “Reckless” (1993). What strikes me most is the difference in what the songs say. I’ll refer to the songs by their performers, but since I’m talking about the words, it’s really the lyricists at work (though the music, as in any good song, reinforces the lyric—and vice versa). For McBride’s song, the writers are Sarah Buxton, Zach Crowell, and Heather Morgan; for Alabama’s, Michael Clark and Jeff Stevens. Alabama’s song is an ode to spontaneity, with its overtones of rebelliousness and adventure. The singer and his girlfriend are dissatisfied with life in their Texas small town. He wants them to take off somewhere else, anywhere else. This trope is firmly rooted in classic American tradition. It lines up with a long tradition of such anthems. Wilson Phillips’ “Impulsive” comes to mind, where “reckless” is the second adjective the singer applies to herself (to her own surprise) in the refrain. Love of spontaneity has a much broader reach than love songs alone. Our fascination with the impulsive, boundary-breaking individual includes, for example, the recurrent trope of the “loose-cannon cop who doesn’t play by the rules” (TV Tropes calls it Cowboy Cop). The attitude is canonized in the “chaotic good” alignment featured as one of the options in Dungeons & Dragons and other role-playing games (you can find descriptions on Wikipedia, TV Tropes, or elsewhere). And breaking everything I ever had . . . The singer seems to be sorry about her ungoverned behavior, or ashamed of it. She even calls it “criminal” in the refrain. She feels her beloved cares for her despite this chaotic quality, not because of it. Originally I wondered whether this new song represented a change in attitudes over time. We are highly sensitive today to unintended consequences, including “collateral damage”—in everything from environmentalism to superhero movies (the damage caused by epic battles is a major plot driver in this year’s Captain America: Civil War and Batman v. Superman: Dawn of Justice). One might suspect we’re becoming less enthusiastic about recklessness than we used to be. On the other hand, we’re still getting just as many images in which operating outside the law is seen as a good thing. The screenwriters’ sympathies seem to lie more with the “chaotic” side in both those films. It would be rash to imagine a reversal of so pervasive an attitude based on one song. But there’s more to it: McBride’s song has another layer. Her lover’s willingness to cope with her erratic nature also represents daring or courage. The last lines of the refrain are: “For loving me the way you do—I know I’m reckless—but you must be reckless too.” Loving someone who is so uncontrolled is its own form of recklessness. This kind of risk-taking appears in the song as a good thing. She—and we, the listeners—want him to take that chance. Only when he does so can he prize who she really is, and see her lovableness: “For looking in my eyes and seeing the soul inside . . .” It’s the difference between acting unthinkingly or destructively, and taking a desperate risk in a good cause. McBride’s “Reckless,” in other words, draws our attention to the fact that there is a certain kinship between the kind of recklessness that represents pure spontaneity (and can go drastically wrong), and the kind that dares to take the necessary risks to love someone. And, yes, can also go drastically wrong. This truth holds to some extent for everybody. None of us is ideal and unexceptionable. We’ve all squandered opportunities and stumbled through life. Committing ourselves to any of us flawed human beings means taking chances. Love always requires courage.